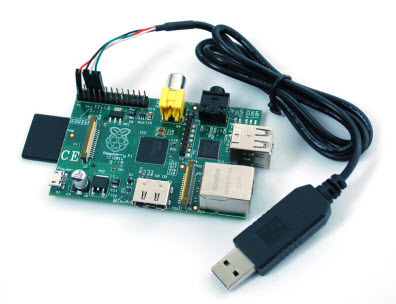 Raspberry Pi features a 3.3V TTL level serial port through the GPIO ports. It is configured by default as a console port in the R.Net Rasbian Linux for on-site console access as backup if and when the LAN/VPN access is not available. It is not recommended to alter this configuration to use the GPIO serial port for other purposes. If serial ports are needed for other purposes (APRS, radio control, etc. ), a USB to RS232 converter is recommended. The GPIO serial port console can be accessed the easiest using a USB to 3.3V TTL serial converter. The converter represents itself as USB serial port to the host computer, which can be used through a terminal program. The console port UART pins are located on the edge of the GPIO pin header. Additionally 3.3V and 5V are available on respective pins to power up the converter if needed. Usually USB converters power up from the host USB port.